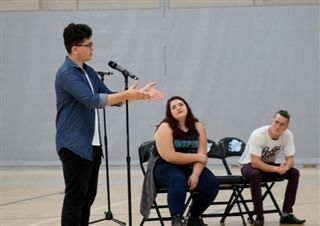 During last Thursday's Community Life, Pacific Ridge senior Khalid Abudawas performed spoken-word poetry alongside two additional members of Glassless Minds, a non-profit that seeks to facilitate young adults' creative expression through workshops, mentoring, open mics, classroom discussions, and performances. The trio shared personal stories about the role art has played as an emotional outlet in their lives, and performed original pieces about identity, acceptance, relationships, and more. Several brave students from the audience also joined in on the performance by volunteering to improvise poems about community.